Rock & Metal 4 You: CD-Review: Hollywood Vampires (Alice Cooper/Johnny Depp/Joe Perry) - "Hollywood Vampires"
CD-Review: Hollywood Vampires (Alice Cooper/Johnny Depp/Joe Perry) - "Hollywood Vampires"
I think it was three years ago when shockrock legend Alice Cooper was talking about doing a cover album, a tribute to his "dead friends" like Jimmy Hendrix and John Lennon. Since then there was not much information about it and I thought this album will never happen. Earlier this year it was announced that Cooper wanted to reanimate the Hollywood Vampires, a club of famous rockstars at Sunset Strip from the early 1970's, with none other then Joe Perry from Aerosmith and Hollywood superstar Johnny Depp. So what was meant to be a simple Alice Cooper cover album became much bigger when more Rock'n'Roll legends such as Brian Johnson, Paul McCartney, Slash, Kip Winger and many more joined the "Vampires". With such namedropping expectations became quickly very high. Nowadays lots of people are doing their "supergroup"-thing, but hell yes - THAT IS a supergroup. 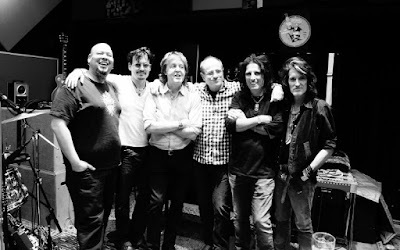 Like the original Hollywood Vampires this "band" consists of longtime friends who share the passion for Rock'n'Roll music of the older days and you hear that in every minute of this record. "Hollywood Vampires" is a time machine that takes us back to the 60's and 70's and it sounds so authentic. The whole production is very earthy and has this kind of garage band feeling to it that creates a very special atmosphere. It's like you are part of a jam session and that is much fun to listen to. Every note of this album is an excellent homage to Classic Rock'n'Roll. As always when it comes to cover albums there are songs that work for you and some don't. It's the same here. How much you enjoy this album depends on how much you are into the original songs. So here I've to say half of the tracks weren't my cup of tea, but that is a matter of taste. I didn't get into "Whole Lotta Love" (altough Brian Johnson sounds pretty cool on this one), as well as "One/Jump Into The Fire" or "Manic Depression". They didn't want to grow on me and melodies didn't stuck in my head. But if you love the original songs you'll love those cover versions too, because they aren't weaker. Some tracks sound even better to me than the originals. "My Generation", "Five To One/Break On Through (To The Other Side)", "Come And Get It" (McCartney at his best!) and "Itchycoo Park" never sounded that powerful. My personal highlight was Cooper's very own "School's Out" that was mixed up with "Another Brick In The Wall" featuring Brian Johnson on vocals and Slash on guitar. Johnson together with Cooper on "Schools Out" - how amazing is that?! It fits perfectly and both do a very good job here. In general Alice Cooper shows how flexible his voice is. Also the intro that features Sir Christopher Lee (R.I.P.) as narrator is very atmospheric and has this kind of 70's horror movie feeling to it. But with all these good things there is still room for improvment in my opinion. I really don't get why this album was advertised as a collaboration between Cooper, Depp and Perry because Joe Perry just appears on 4 or 5 tracks as one of many guitar players and he was also not involved in the songwriting of the two new songs "Raise The Dead" and "My Dead Drunk Friends", which sound way too bulky by the way. Even in the "Special Thanks" section of the CD just Alice and Johnny Depp are mentioned. Maybe this sounds weird now but my major problem with this album is the mass of guest musicians, especially the huge number of guitar players. They are all legends, we all know that - and that makes it even more disappointing because nobody of them has the chance to shine on this record. Imagine there are four guitarists that play in one single song that is under three minutes long. What the hell? Johnny Depp for example is always featured on guitar but I can't tell you which solo he played or if he was just on the rhythm guitar and same goes to all the other guitar players. There is simply not enough space for them to bring their skills to life. It would have been much better when one or two guitarists would have played on each song. Then they could have unfold their unique style in solos and so on. There are so many gifted players with individual styles on here and you don't notice it in all these songs. This is so sad. Don't get me wrong - it all rocks, it all sounds good but it could have been much more individual. But in the end of the day this shouldn't stop you from buying "Hollywood Vampires" because it is a worthy cover album that does the original songs justice and the great atmorsphere throughout the entire album is awesome. It's definitely not this kind of cheap cover album where musicians just want to make some money on the easiest way possible. It's a record that was done with much passion and fun. 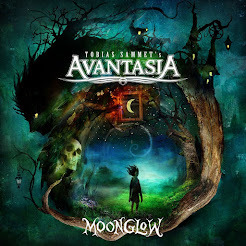 If you love the songs of that particular era or if you are into Classic Rock in general this album is for you! Oh and Alice Cooper fans will also find what they are looking for.